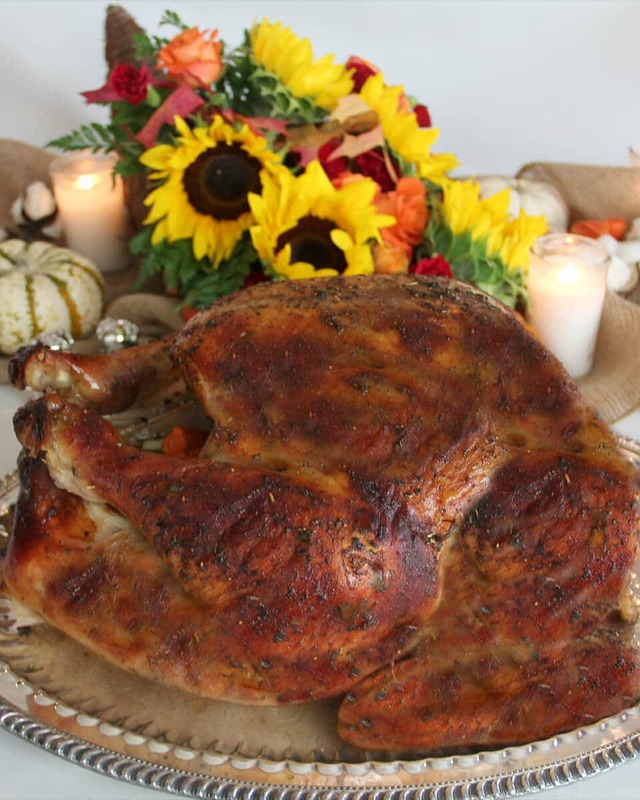 Roast Turkey is the centerpiece of your Thanksgiving table, so it’s important to get it right! 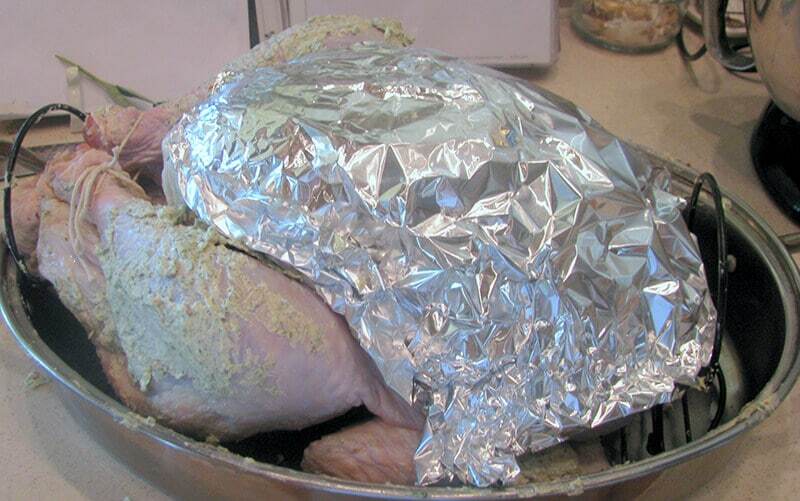 This method uses foil to keep the turkey breast from drying out so you have a perfect Roast Turkey every time! Being in charge of the Roast Turkey for Thanksgiving can be a daunting prospect, especially for first-time cooks. And the Internet can make it a very confusing process: there are about as many ways to roast turkey as there are turkeys. 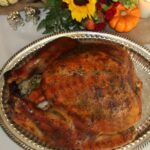 I’ve been responsible for the turkey for my husband’s family for almost 15 years now, and I cooked a few before that as well, so I’ve tried many different methods. I’ve roasted the bird upside down, on its side, under foil, at high temperature, at low temperature—and needless to say, I’ve had some roast turkey disasters over the years. I do like the method of starting the turkey with breast side down; however, since I usually cook a 20+ lb. turkey, this method doesn’t work well for me. I always slather my turkey in herb butter before roasting, so just imagine trying to turn a heavy, hot, slippery turkey onto its back after it’s been in the oven for an hour. After a couple of years of trying this and ending up either burned or with broken turkey parts, I’ve given up on this one. Some things are best left to the basics and the perfect roast turkey is one of those. However, if you want to get the bottom side of your turkey nice and brown and crispy then start with breast side down for about an hour. With that said, there are a few steps that make all the difference in whether your roast turkey ends up dry or perfectly cooked. I always brine the turkey, rub it down with herb butter and I always use a thermometer to make sure it doesn’t overcook. And plan your cooking time far enough in advance that you can let the turkey sit out for at least an hour before roasting, and half an hour after roasting. And plan for thawing time if the turkey is frozen, brining time and also time to let it sit for several hours after brining. What kind of turkey should you cook? 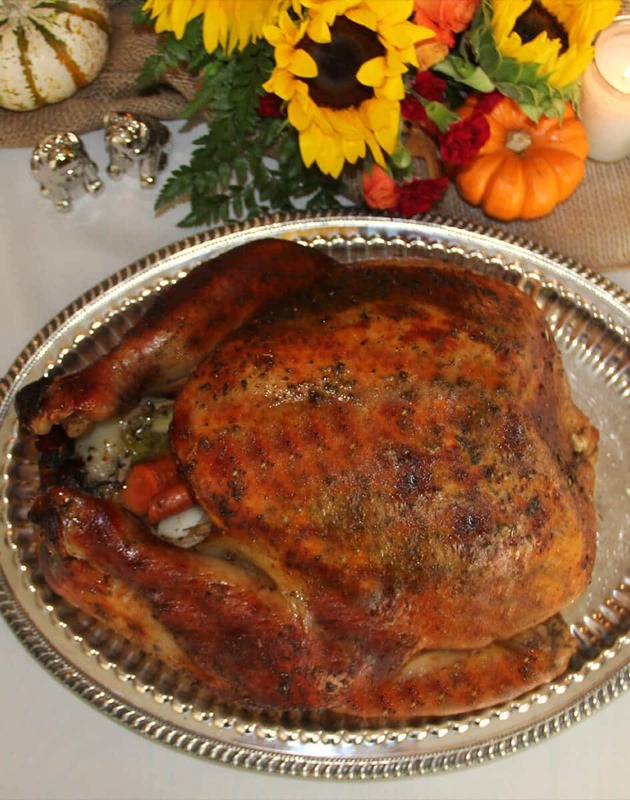 I’ve used the frozen grocery store turkey, an expensive heritage turkey, a fresh turkey, and whatever is in between. And if you cook them correctly, all can turn out well. 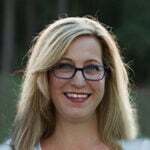 I usually go with a fresh turkey that isn’t kosher and has had minimal processing and no solutions added—these can be tough to find, however. If you’re stuck with using a frozen grocery store turkey, then try to get one with the least amount of sodium solution injected, and be sure you let it thaw with enough time to brine it for at least a few hours. But you should decrease the amount of salt in the brine and the brining time, otherwise the roasted turkey will be too salty. Even though many people will tell you not to brine these turkeys at all, I’ve done it and they were not too salty and the brining helps the meat stay moist. Just watch the amount of salt you use. Suppose you don’t have a fancy roasting pan with a rack? You can roast the turkey in a heavy, deep bottom pan and use coils of tin foil to make a rack. You can also use a disposable pan as a last resort, but this won’t conduct the heat as well and your turkey will probably overcook. When you first open the turkey, remove the turkey neck and giblets. They are sometimes in two places: in a bag in the large cavity and a smaller bag in the neck cavity, so be sure you check both. Save these in the refrigerator until you’re ready to make giblet gravy. If you’ve brined the turkey overnight, remove it from the pot and pat dry all over with paper towels. Now let the turkey sit, uncovered, on a cookie sheet or even in the roasting pan for several hours in the fridge. You can even leave it overnight. This helps to dry the skin so it will get nice and crispy, while the meat stays moist from the brine solution. If you don’t have time for this step then just be sure to get the turkey as dry as you can with paper towels. Let’s cook a turkey! Position the oven rack on the lowest setting and preheat the oven to 325°. Place the turkey in a large roasting pan with a rack and then tuck the wing tips underneath the back of the turkey. Then tie the legs together with twine or tuck them under the little piece of skin at the end of the turkey. Then rub the herb butter all over: top, bottom, legs, sides, and carefully underneath the breast skin. When trying to spread the butter underneath the skin, you have to break the membrane holding the skin to the flesh. Just press your fingers under it and it will break. But be very gentle. I tore the actual skin on the last turkey I cooked, so the breast wasn’t very pretty. You don’t need to salt the turkey if you’ve brined it, but you can grind a little fresh pepper if you like. Next, pour a couple of cups of stock or broth in the bottom of the pan so it won’t dry out and then place a few herbs and vegetables inside the turkey. I don’t cook dressing or stuffing inside the turkey. I use rosemary, thyme, sage, onions, carrots and celery. Then I take a couple of lemons, halve them and squeeze the juice inside the cavity then throw the lemon halves in there also. Sometimes, if there’s room I might throw in a cut-up apple too. After you’ve added the aromatics to the inside of the turkey, it’s time to take care of the outside. Here’s the old-fashioned trick that’s going to keep your breast meat from overcooking: take two pieces of heavy duty aluminum foil, butter one side or spray with cooking oil, and cover that breast completely. The turkey is now ready to go into the oven. Just slide the pan onto the lowest rack and close the door. After an hour, baste the turkey with some of the juices from the pan, lifting up the foil to baste underneath. Continue basting every hour but no sooner than that. A lot of experts will tell you not to baste the turkey because every time you open the oven door you lose heat and the turkey takes longer. Maybe it does. But I baste every year and as long as you don’t overcook the turkey then it’s not a problem. I like how it helps the skin get nice and brown and slightly crispy—perfect roast turkey. Be sure you figure cooking time at about 15 minutes per pound, and remove the foil about an hour before the turkey should be done. Baste the breast again so it will brown nicely. You can also turn the turkey on each side for about 15 minutes if you want the bottom/side to be a little more browned. Place the meat thermometer into the thigh at the thickest part, but not touching bone, and when it reads 165°-170°, remove the roasted turkey from the oven. Let the roast turkey rest for at least half an hour before you slice it. 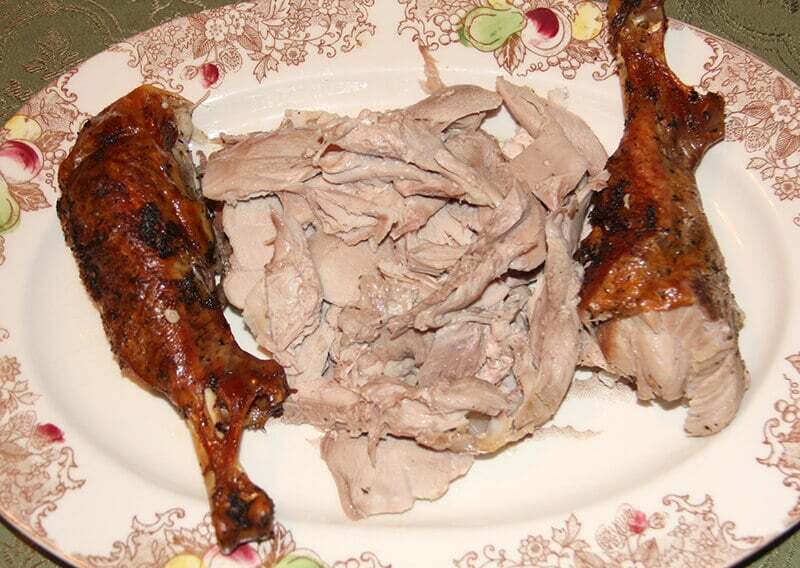 We usually slice up a platter of dark meat and a platter of white meat so it’s easy to choose. And there you are! A perfectly cooked, moist, delectable roast turkey. And don’t throw away that carcass—you need it to make leftover turkey gumbo. The perfect roast turkey is within reach by following these easy instructions. No more dry turkey! A frozen turkey will take at least 3 days to thaw out in the refrigerator, then a day to brine and a day to sit in the refrigerator after brining. Plan your cooking time far enough in advance that you can let the turkey sit out for at least an hour before roasting, and half an hour to an hour after roasting. If using a pre-basted turkey, decrease the amount of salt in the brine and the brining time, otherwise the turkey will be too salty. 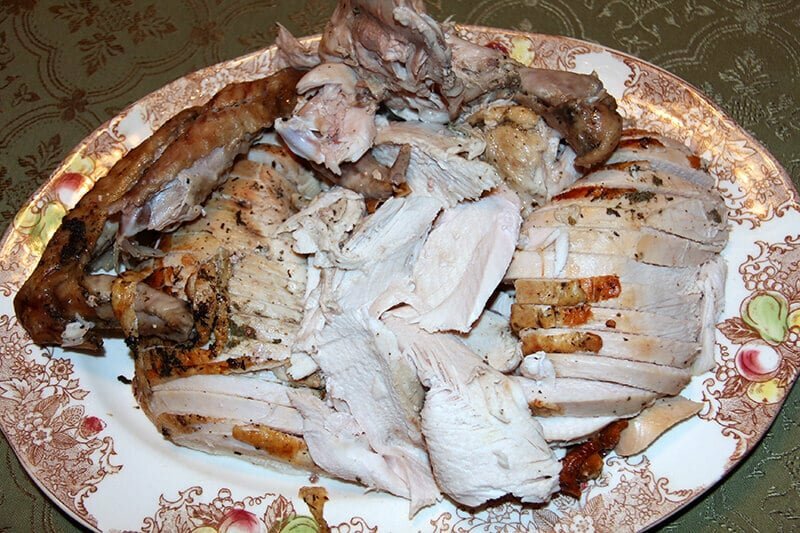 If you've brined the turkey overnight, remove it from the pot and pat dry all over with paper towels. Now let the turkey sit, uncovered, on a cookie sheet or even in the roasting pan for several hours or overnight in the fridge. This helps to dry the skin so it will get nice and crispy, while the meat stays moist from the brine solution. If you don't have time for this step then just be sure to get the turkey as dry as you can with paper towels. Position the oven rack on the lowest setting and preheat the oven to 325°. Place the turkey in a large roasting pan with a rack and then tuck the wing tips underneath the back of the turkey. Tie the legs together with twine or tuck them under the little piece of skin at the end of the turkey. 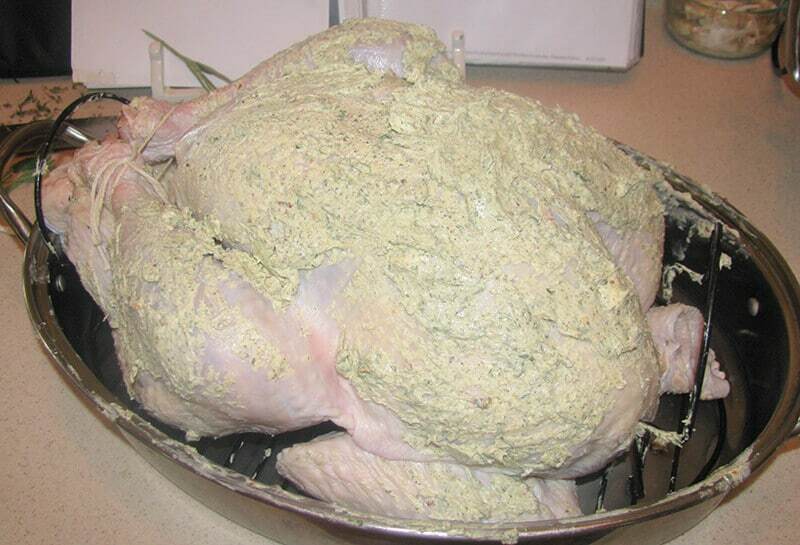 Then rub the herb butter all over: top, bottom, legs, sides, and carefully underneath the breast skin. When trying to spread the butter underneath the skin, you have to break the membrane holding the skin to the flesh. Gently press your fingers under it and it will break. You don't need to salt the turkey if you've brined it, but you can grind a little fresh pepper if you like. 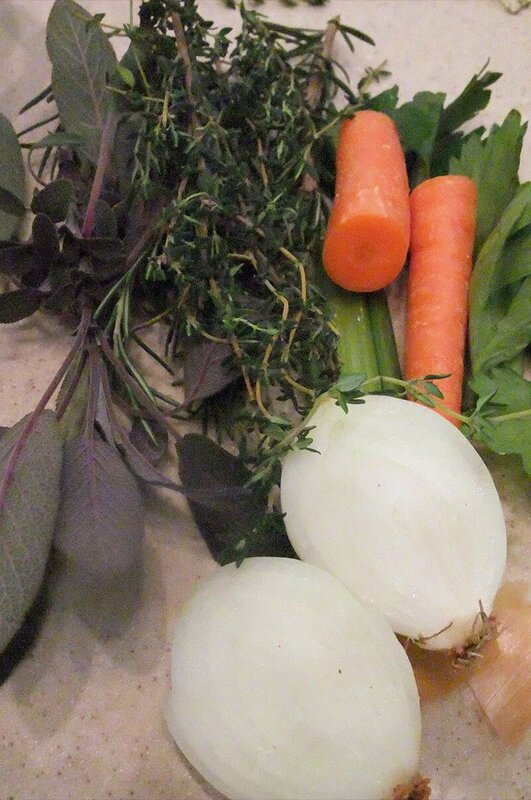 Pour a couple of cups of stock or broth in the bottom of the pan and place a few herbs and vegetables inside the turkey: rosemary, thyme, sage, onions, carrots, celery. Add two lemons, halved, and squeeze the juice inside the turkey cavity then throw the lemon halves in there also. If room, you can add a cut-up apple. Take two pieces of heavy duty aluminum foil, butter one side or spray with cooking oil, and cover that breast completely. Slide the roasting pan onto the lowest oven rack and close the door. After one hour, baste the turkey with some of the juices from the pan, lifting up the foil to baste underneath. Continue basting every hour but no sooner than that. Calculate cooking time at about 15 minutes per pound, and remove the foil about an hour before the turkey should be done. Baste the breast again so it will brown nicely. If your turkey is not too large to handle safely, then you can turn it on each side for 10-15 minutes to brown underneath the legs. Place the meat thermometer into the thigh at the thickest part, but not touching bone, and when it reads 165°, remove the turkey from the oven. Let it rest for at least half an hour before you slice it. Great recipe and also very detail steps. I turn the turkey upside down to prevent the breast from drying out. Great tips! I hope you and your family had a wonderful Thanksgiving!